Donald Trump still isn’t admitting that his widely documented half a dozen corporate bankruptcies over the years actually exist. But during a rally today in the swing state of Colorado, Trump made a strange admission while dancing around his newly exposed catastrophic personal financial collapse in the year 1995: he said he would have “loved” to have declared personal bankruptcy. 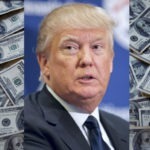 The unseemly admission came even as Trump was trying to make the even more surreal case that back in 1995, the United States was suffering its worst financial stretch since the Great Depression. He appeared to have been trying to rewrite history so he could blame his own nine hundred million dollars in single-year losses on someone other than himself. So there you have it. Even as Donald Trump continues to insist that he somehow never delved in bankruptcy despite the six different corporate bankruptcies he’s invoked, he’s now suggesting that he wishes he could have gone bankrupt, even while in the same breath seemingly taking it back. This comes just one week after Donald Trump took his lumps in the debate by suggesting that his failure to pay his taxes made him “smart” – a quip which his opponent Hillary Clinton has been seizing on ever since. It also comes just two days after his leaked tax returns from 1995 started a national conversation as to whether Trump was cheating on his taxes or whether he’s truly that bad of a businessman.